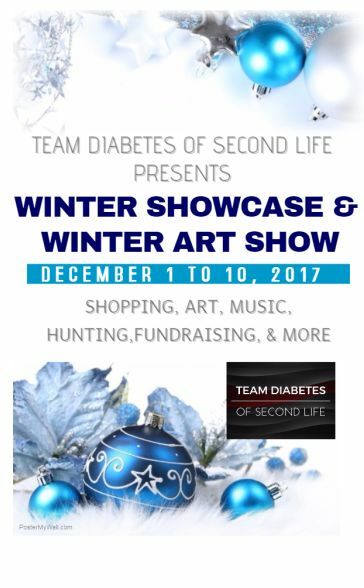 The 2017 Team Diabetes of Second Life Winter Art and Showcase event opens on December 1st, 2017 and run through until December 10th, inclusive. As with previous years, the event will include ten days of live performers, DJs, concerts, tribute acts, hunts, ice skating, ice fishing and, of course the Winter Showcase and the Kultivate Winter Art show. All to raise money for the American Diabetes Association (ADA), through Team Diabetes of Second Life, ADA’s official and authorised in-world fund-raising team. Over 40 merchants are participating in the showcase, comprising: Aleutia, alme., Beyond Persuasion Design, Blossom, BYRNE, ChiC Buildings, Chiffon, Chop Zuey Couture Jewellery, Dixie Dandelion and Designs, DBS, Emerald Couture, Fjordian Slip, Get Jiggy, Ghee, Gidget’s Style, Go Frock Yourself, Just Ordinary, Kades, Kiliki Bikini, LC Fashion, Le Fashion Whore, Love, Lunar Seasonal Designs, MadCatCreations, Mara’s Mysteries, Mahlberg Tailors, Metal & Stone, OMG! Inc, OYO Breedables, Park Place, Potomac Signature Homes, Roth’s, Rush, Shiva, Simply Shelby, Sohoe Shoes, Spyralle, Steelhead, Tayren’s Fantasy Fashions, TRS Designs, Tylar’s Treasures, Winterwood, Wood Works, Xanna Wahwah Designs, and Xplicit Designs. Merchants are each offering at least one item among their displays with 100% of proceeds from sales going directly to Team Diabetes of Second Life. The Showcase once again occupies half of Kultivate Magazine’s home region, a short walk from the brand’s art gallery spaces, and faces the Winter Art Show. Sponsored and produced by Kultivate Magazine, the Art Show features the following artists and photographers: AlexAvion, Anjelikka, Bri Graycloud, alystiaMoonShadow, Caresia Adored, Carisa Franizzi, Carlotta Ceawlin, Catalina Staheli, Chanasitsayo, DAKOTA LAVAROCK, Eucalyptus Carroll, ilyra chardin, Jamee Sandalwood, JolieElle Parfort, John Brianna, Layachi ihnen, maaddi, Paaie, roadrabbit resident, roxaane Fyanucci, Sandi Benelli, saoirseheart, Sheba Blitz, Slatan Dryke, smalldoll resident, talligurl, tessagrace51, Tutti Kaya, Veruca Tammas, & wintergeist. All artists are also offering at least one item of art for sale with 100% of preoceeds going to Team Diabetes of Second Life. The Reindeer Hunt – find the reindeer scattered throughout the events and pay each of them L$10 (all proceeds to Team Diabetes of Second Life) to claim a prize. Santa Quest – purchase a HUD for L$150 from the kiosk near the landing point and help put Santa together again after he crashed his sleigh! Find the pieces, put things together and claim ten prizes. There is also daily entertainment through the event – see the event and entertainment schedule for entertainers and times.